Winter has arrived in Sydney with the temperature actually dropping below 20 degrees throughout the day after what was an absurdly warm Autumn. The onset of winter means the coming of waves for Sydney and of course for most coastlines of the world. Before the weekend of the 14th the forecast showed a likely south pulse in swell on late Sunday afternoon (15th of June) generated by a big southern ocean low pressure system below Tasmania. The swell was predicted to peak rapidly on Sunday afternoon with Monday likely to provide large (6-8 ft in the Australian/Hawaiian surf estimate) waves with gentle offshore winds. 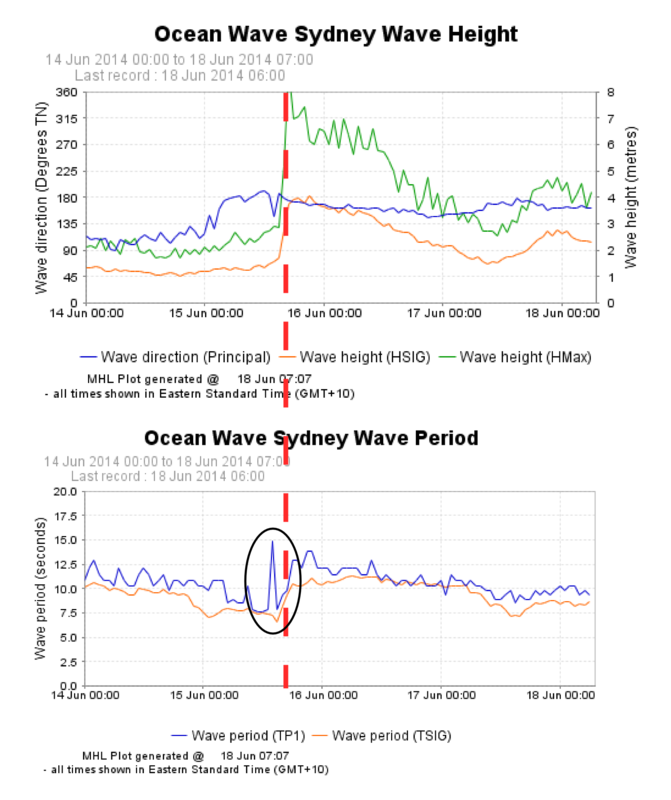 In scientific terms this pulse in swell was meant to provide storm swell with offshore significant wave heights greater than 3 m.
Take a look at the recorded offshore wave data provided by Manly Hydraulics lab for Sydney which clearly shows the rapid onset of 4 m plus significant wave heights with a maximum wave height off the scale, greater than 8 m. This is a large swell event for this region but also relatively short lived, lasting only a day or two. The swell also shifted to being almost directly from the south with south facing beaches significantly impacted. What is interesting about this swell event is the peak in wave period of 15 seconds (black circle) which precedes the main component of the swell of about 12-13 seconds and Hs of 4 m which (defined by the dotted line). This is a classic case of long period ‘forerunners’ telegraphing the arrival of an imminent swell event. This phenomenon is due to the sorting and ‘grooming’ of groundswell through wave dispersion. When waves are generated in large storm cells they are of varying wave length, period, and height. Waves with longer periods travel faster than short period waves with the sorting of waves due to differentials in speed (termed celerity) one of the methods in which swell is organised after its chaotic inception in a storm. Long period waves that are initially generated by the storm can ‘out-run’ the main body of the swell which has slightly shorter periods but in this instance more wave energy. For a better example of swell ‘forerunners’ check out the Swellnet article on wave dispersion which was previously posted on our Facebook page, but here it is again. http://www.swellnet.com/news/swellnet-dispatch/2011/04/28/why-swell-train-often-late. While it’s not exactly new science this emphasises that the hydrodynamic theory you learn in lectures, papers, and textbooks can be easily applied to the real world. ← New sea surface temperature record since the last ice age published for the Great Barrier Reef!